For my next read, I picked up one of the ARCs I had received when I attended the OLA Super Conference. 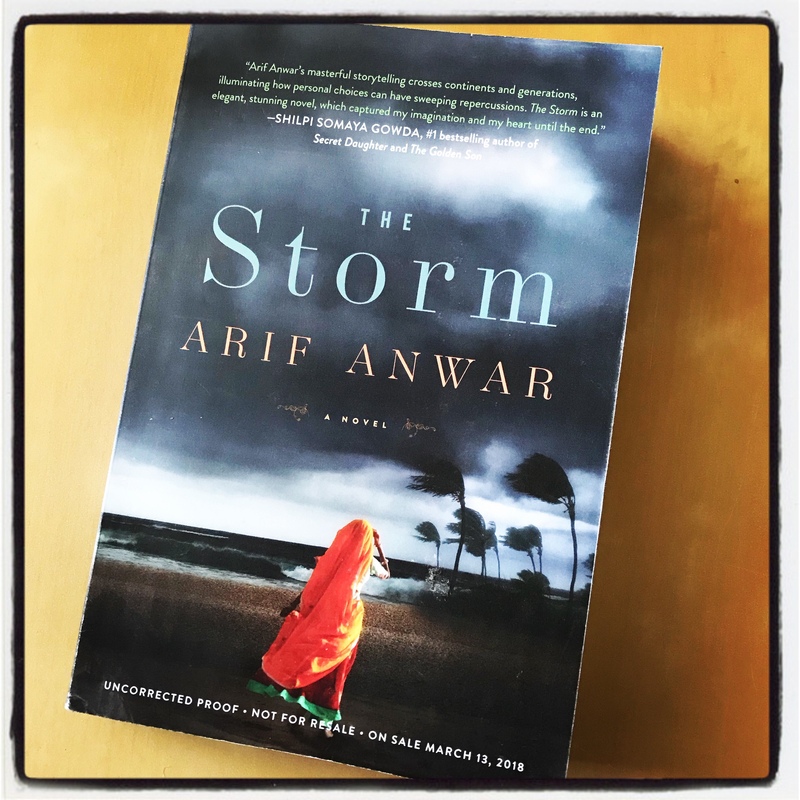 The novel, The Storm, was written by debut writer Arif Anwar and interweaves five love stories that chronicle sixty years of Bangladeshi history. Shaahryar, a recent PhD graduate and father of nine-year-old Anna, must leave the US when his visa expires. In their last remaining weeks together, we learn Shahryar’s history, beginning in a village on the Bay of Bengal, where a poor fisherman and his wife are preparing to face a storm of historic proportions. Their story intersects with those of a Japanese fighter pilot, a British female doctor stationed in Burma during World War II, and a privileged couple in Calcutta who leaves everything behind to move to East Pakistan following the Partition of India. The structure of the novel mimics a storm and builds towards a series of moving climaxes while it explores the ways in which families love, betray, honour, and sacrifice for one another. The story is grounded in history as it spans decades and moves between two continents. The writing is moving; the words creating beautiful images in the mind. The beginning of the novel seemed slow-moving, yet beautiful, as I got to know all the characters in the story. Once I knew all the players in the story, I could not help but turn the pages. With the turning of the pages, I grew to understand the upheaval people experienced with the changes in India. I grew to understand a little, as well, the upheaval those experience who need to leave their loved ones behind. The Storm is a novel I would recommend for those who enjoy reading a little history in their stories. In addition, the heartbreaking tales depicted in this novel conjure a sense of reality and pull at the heartstrings. This is a novel I will not forget quickly. Do you enjoy reading novels set in India? The book is beautifully written. It is not often a story makes me cry. It sounds like you were really invested in the story – great review! Thank you Christy. I enjoyed the story so much I passed the book onto a friend whom I know will love it.